Our NBC air filtration units are the very best that the market has to offer. We’ve combined the most effective HEPA and ULPA filters with the incredible force of military-grade activated TEDA carbon. The majority of air filtration systems use only one component, such as a stand alone HEPA filter, or ULPA filter. 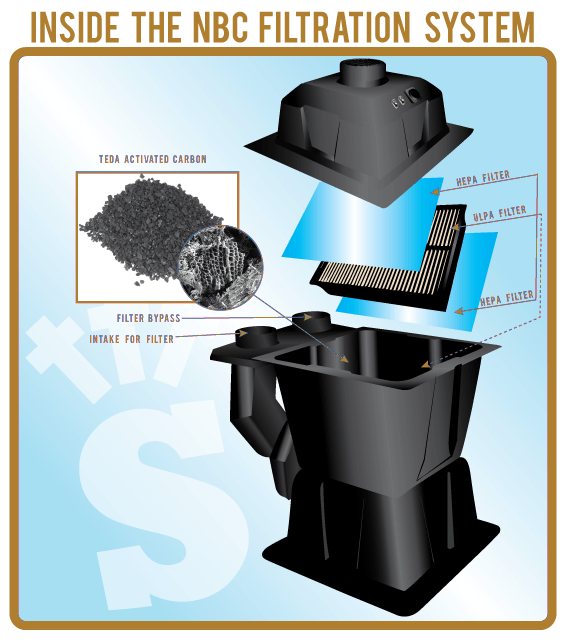 Rising S Bunkers combine all three filters together to form the best possible NBC Air Filtration system. This system will filter 99.99 % of the air’s contaminates and toxins from your breathable air. Nuclear, chemical, biological – it makes no difference, this system can handle it. In our NBC Air Filtration units, air has to pass through three forms of air filters. The three components of our air filtration units are highly effective at filtering out different contaminates in the air. When placed within our NBC air filtration system, they work together to filter a wide range of contaminates from the air. Air passes through the first HEPA filter, then through the ULPA Filter, and through another HEPA filter. Any contaminate that manages to pass through the HEPA filters and the ULPA filters will get absorbed into the TEDA activated carbon filter. Here’s what our system looks like inside.